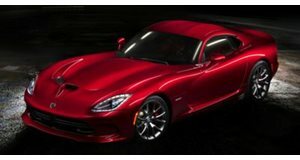 "Top Gear's" tame racing driver had his hands full with Dodge's track-focused Viper. A brutish V10 engine and gobs of downforce mean you can take straights and turns at high speeds in the Dodge Viper ACR. However, don’t expect the Viper ACR to make things easy on you, as proved by this new video from “Top Gear.” In it the Stig pilots the track-focused muscle car around the "Top Gear" test track in a time of 01:15.1. That is good for fifth place on the show’s leaderboard, although for some reason the leaderboard hasn’t been updated to reflect the results from last season. The in-car camera focus in this video allows you to see just how much control is required to lap a track full-out in the Viper ACR. It's a lot harder than, say, driving it flat out and yelling the whole time. The Stig wrestles with the wheel on turns while bumps shake the car like a recovering alcoholic playing a game of Jenga. This video is a reminder that a car's true performance cannot be unlocked without a hell of a driver behind the wheel. A 645-horsepower track monster in the wrong hands would never have come close to lapping the “Top Gear” track in such a quick time. We are going to miss the Viper so very much.